ChekMate Quality Control kit contains 4 specially-configured check strips and 2 MEMo Chips® which allow the user to test up to two devices simultaneously to verify performance. Two level dry strip quality system to verify CardioChek PA/Plus device. A two level dry strip quality control system designed to verify the performance of the Silver CardioChek PA (version 2.6 & up) device. ChekMate tests the optics of the analyzer. Liquid controls still need to be used to test the strips accuracy. Eliminates the daily cost of running (2) levels of HDL and Multi-Chemistry liquid controls. Return on investment after approx. 5 uses. Use repeatedly over the recommended life of the product (500 uses or 18 months). 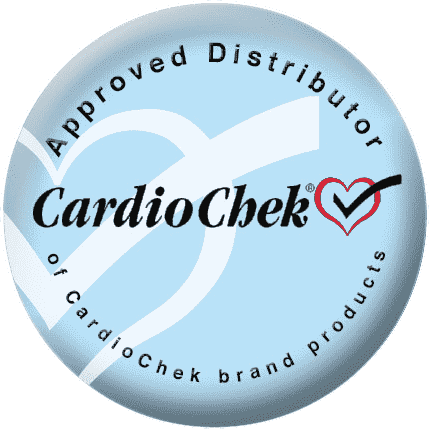 The CardioChek ChekMate™ is a two level, dry strip quality control system designed to verify the performance of the CardioChek® PA device. CardioChek Chekmate is to be used in conjunction with liquid PTS Panels® Quality Controls. Device Quality Control Strips To check device operation, it is recommended that ChekMate Quality Control strips be run once each day of device use. Both Level 1 and Level 2 ChekMate Quality Control strips will report four (4) results. These results (C1 RED, C2 RED, C3 RED, C1 GREEN) correspond to a specific optical reading for each chemistry test “window”. 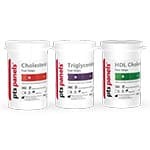 To check the performance of the entire CardioChek test system: CardioChek PA device, MEMo Chip®, and PTS Panels test strips; it is recommended that the liquid PTS Panels Quality Controls be run whenever a new lot of PTS Panels test strips are received or as required by local accrediting and regulatory bodies. Please refer to the liquid PTS Panels Quality Controls package inserts for instructions on how to run liquid quality controls. Handle the ChekMate Quality Control strips with care; do not drop. Do not store or operate in direct light. The control strips should always be stored in the original container when not in use to protect from light and from accidental scratching. Never touch the blue membrane which is the read area of the control strip. Do not expose control strips to high humidity, extreme heat, cold, dust or dirt. ChekMate Quality Control strips are designed to closely simulate actual test conditions in the process of assuring proper device function; thus recommended usage is 500 uses or 18 months. Store in a cool dry place at room temperature of 68-80°F (20-27°C) and 20-80% relative humidity (RH). Always store in the original container when not in use to protect from light and from accidental scratching. Do not freeze. Insert the ChekMate Quality Control MEMo Chip. Insert the LEVEL 1 ChekMate Quality Control strip into the CardioChek PA device. Press and release the NEXT button to cycle through the results and read each test window. Record results on the ChekMate Quality Control Result sheet. Compare the results to the LEVEL 1 acceptable ranges printed on the ChekMate Quality Control Result sheet or visit www.cardiochek.com to get a list of the LEVEL 1 acceptable ranges. Remove Level 1 ChekMate Quality Control strip and press ENTER. Repeat steps 3 – 7 with the ChekMate LEVEL 2 Quality Control strip and LEVEL 2 acceptable ranges. Results are displayed as the following readings: C1 RED; C2 RED; C3; RED; C1 GREEN. These correspond to each chemistry test “window”. 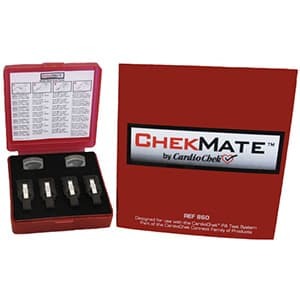 All results for the ChekMate Quality Control strips should be within the ranges specified on the ChekMate Quality Control Result sheet or listed at www.cardiochek.com. Users may also track their own results and define a narrower acceptance limit based upon the trend for each device as test results accumulate. If test results are outside the specified range, re-test. Should unexpected results be observed, suspect control strip damage and replace immediately.